Folding Pan Holder. 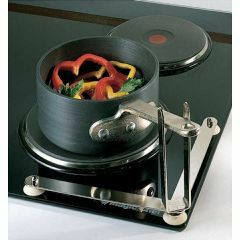 Keeps the pan from turning when cooking on stove. One leg folds in for easy storage in the kitchen drawer. Sturdy plated steel with rubber suction cup feet. Holds 2 quart pan and is adjustable. Diameter 7 1/2". Latex free.